Nokia has announced that its Steel HR hybrid smartwatch will ship in time for the holiday season, almost a year after it was supposed to launch under the Withings moniker. The watch was first announced in September 2016, but its scheduled launch the following month never happened as Nokia began negotiating its takeover of Withings, which was eventually finalized in June. 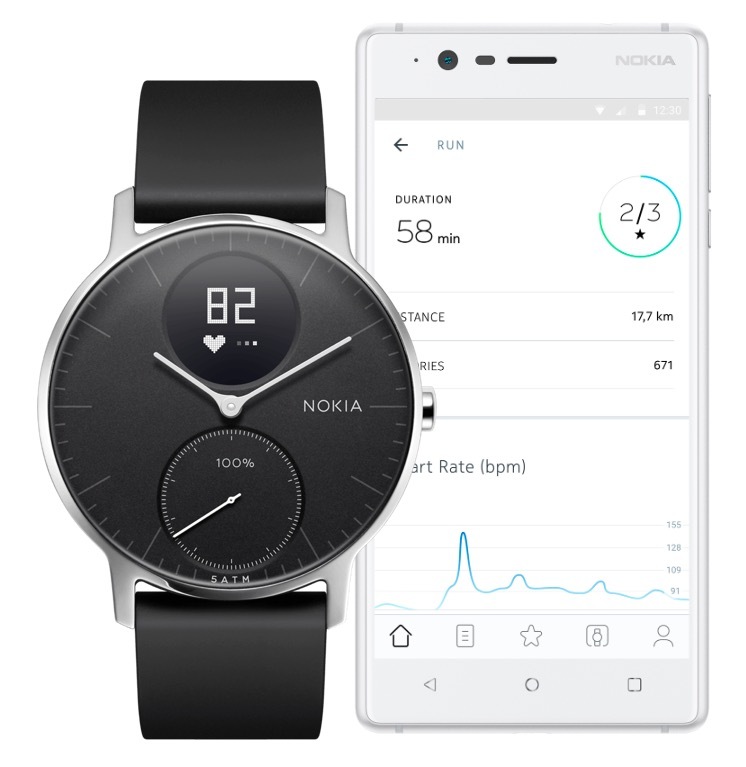 Shortly thereafter, Nokia relaunched several Withings products under the Nokia brand, including the Nokia GO and Nokia Steel watches, as well as Nokia BPM+ and Nokia Body+ connected devices. The Steel HR finally joins the existing line-up and will be available in 36mm and 40mm case sizes. It features a simple and stylish analog watch face with unobtrusive digital meters for tracking heart rate and movement over the course of the day. In addition, the watch features automatic and learned activity tracking for over 10 activities, a comprehensive sleep monitor, and text, call and event alerts. Nokia says it has also made some software improvements to the smartwatch since its Withings iteration, including an improved heart rate algorithm to ensure more accurate tracking. A design change has also been made that replaces the face with sapphire glass to guarantee up to 50 meter waterproofing. The Steel HR syncs with the Nokia Health Mate iOS app, costs $179.99, and is available to pre-order from the Nokia website in either black or white. Withings has more brand value in my mind than Nokia. Nokia somehow is related to outdated, irrelevant, etc. in my mind. There is definitely a market for hybrid watches ( traditional watches with added digital information and tracking features ). Some people don’t need the full capabilities of an Apple Watch ( or Android based), and like the classical look of a mechanical watch. Unlike computers and phones, a watch is still seen more of a jewelry or fashion accessory than a computing device. Not sure why Nokia are announcing this as a new watch. I've had it for a year under the Withings brand. I'd fully recommend it to anyone as it's a smart watch that is actually smart, doesn't break the bank and lasts around a month before needing a recharge. They're replacing all Withings watches with Nokia versions as there was a condensation issue with most the Withings versions. The Nokia Steel HR has Sapphire glass on the heart rate sensor for improved heart rate accuracy, improved heart rate algorithm, and a redesigned charger that boasts a more intuitive form factor and a stronger magnet for ease of use. I think i'll be buying this watch as it represents the perfect balance between a tracker and a smartwatch. not too intrusive while being useful. All of this with a reasonable price point. I give it 6 months before they go bust! It was dead if it was released earlier. Before xmas with the Apple Watch juggernaut, will ensure it will be super dead! I think there is still a small market for it. Some people still think the Apple Watch looks pretty goofy. I think there is a market for people who like to have a watch that looks like a watch. I personally feel that the Apple Watch is too "intrusive" just like other Android smart watches. I just don't want a smartphone or a computer on my wrist. But this enhanced watch strikes the right balance. I have several WiThings/Nokia health products but this doesn't interest or excite me at all. Too little too late with the Apple Watch dominating this space now. I swore by my Withings Pop until its silent alarm feature stopped working. Does anyone know of a smart watch that offers a silent (vibrate) alarm? All I can find is the Pebble, which is not great for obvious reasons. The Apple Watch. I went from the Withings Activité Pop to the Apple Watch Sport. I loved the battery life on the Withings watch (seven to eight months using a standard watch battery); but I enjoy so much more about the Apple Watch. The silent alarm on the Apple Watch works well for me. The vibration with the Apple Watch is significantly stronger than the one in the Withings watch, in my opinion. Yes, exactly. People have different tastes. Purely subjective. Some people love those Ralph Lauren Polo shirts with the ginmorous Polo logo. Me, I don't even care for the regular size logo. I'd rather have my shirts of top notch pima cotton and logo-free. So yeah, each to their own. I find AW looks like a pregnant Tic Tac, not a beautiful, timeless design. I wish Apple would make a smaller watch with less features, less UI, and longer battery life. Keep the fitness sensors, Apple Pay, and Siri.